Neck muscle activity evoked by vestibular stimuli is a clinical measure for evaluating the function of the vestibular apparatus. Cervical vestibular-evoked myogenic potentials (cVEMP) are most commonly measured in the sternocleidomastoid muscle (and more recently the splenius capitis muscle) in response to air-conducted sound, bone-conducted vibration or electrical vestibular stimuli. It is currently unknown, however, whether and how other neck muscles respond to vestibular stimuli. Here we measured activity bilaterally in the sternocleidomastoid, splenius capitis, sternohyoid, semispinalis capitis, multifidus, rectus capitis posterior, and obliquus capitis inferior using indwelling electrodes in two subjects exposed to binaural bipolar electrical vestibular stimuli. 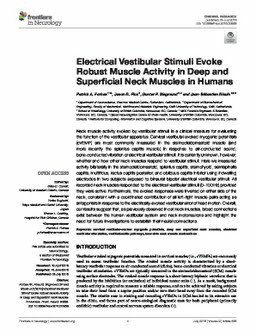 All recorded neck muscles responded to the electrical vestibular stimuli (0-100 Hz) provided they were active. Furthermore, the evoked responses were inverted on either side of the neck, consistent with a coordinated contribution of all left-right muscle pairs acting as antagonists in response to the electrically-evoked vestibular error of head motion. Overall, our results suggest that, as previously observed in cat neck muscles, broad connections exist between the human vestibular system and neck motoneurons and highlight the need for future investigations to establish their neural connections.